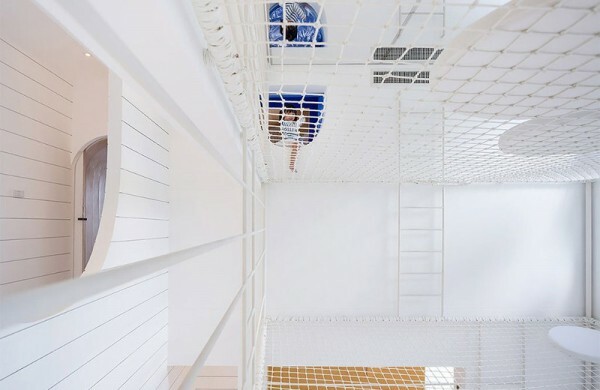 Prepare to be dazzled by this stunning holiday home that provides the ultimate indoor playground for kids, by combining architectural brilliance with nets, slides and tunnels. For one family, it provides an escape from their usually tight surroundings in Bangkok and allows their children to explore and play in the most unique ways. 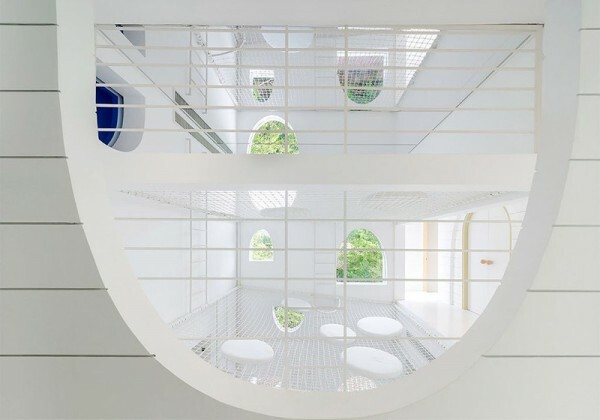 This predominantly white wonder is the stuff of children’s dreams – a house that’s designed with kids foremost in mind, to provide enrichment and engagement through play. The Cha Am Beach holiday house is so awesome that the owner’s children spent their first night in it sleeping on interior nets rather than their beds. And don’t be fooled by that white on white interior – this family actually has four boys but somehow manages to keep it looking immaculate! According to Architizer, the family asked design firm Onion to create an oasis that would provide their children – and extended family and friends – with more of a playground than a traditional house. Known as the Jerry House, it’s made up of a series of passages and nets at different heights and levels. There are all manner of nooks and crannies to explore, with ladders and tunnels linking areas. The inspiration is Jerry, from the Tom and Jerry cartoon series – this is what a piece of his cheese would look like from the inside. The main areas of the house are white, while the bedrooms have a bit more of a personal touch with splashes of colour. Apparently, if a door to one of the children’s bedrooms is locked from the inside, they can only be accessed using a tunnel – which makes it a little more difficult for adults to interrupt secret games! It’s such a stunning space, and a beautifully thought-out hideaway for a family which obviously puts a great emphasis on fun.